1. Good quality: Made of PVC material that resists wrinkling for an always looks new, durable and easy to clean. 2. Anti-slip: Our tablecloth is anti-slip and wears resistant, keep tableware in place when in use. 3. Heat resistant: Reduce the high heat of our dishes harm to the table, prolong the life service of our table or cabinet. 4. Reduce noise: Never again hear the annoying scraping sound of tableware being pushed against the table, our tablecloth helps reduce noise from everyday use. 5. Multipurpose: Can be used as a table cover, desk pads, protective mats to protect your table, desk against scratches, scuffs, stains, spillage. Whilst, show the beauty of your table and furniture. 6. Elegant design: Elegant plaid pattern, luxury and fashion. Good match with your room, great decorate your table. 7. Water & spill resistant: These tablecloths are made of liquids and spill-resistant fabric. They are very easy to clean and helps protect your tables and furniture. 8. Dust resistant: Our tablecloth can be a dust cover, can cover your furniture, prevent dust fall on the surface of your furniture. 9. Furniture protector: Prolong the life of your furniture, protect your table from the effect of oil or soup, make your furniture looks new. 10. Widely use: Suitable for kitchen dining table, TV bench, cabinet, night table, coffee table, outdoor picnic, BBQ, camping, barbecue, banquet, party, meeting room, hotel and so on. 11. 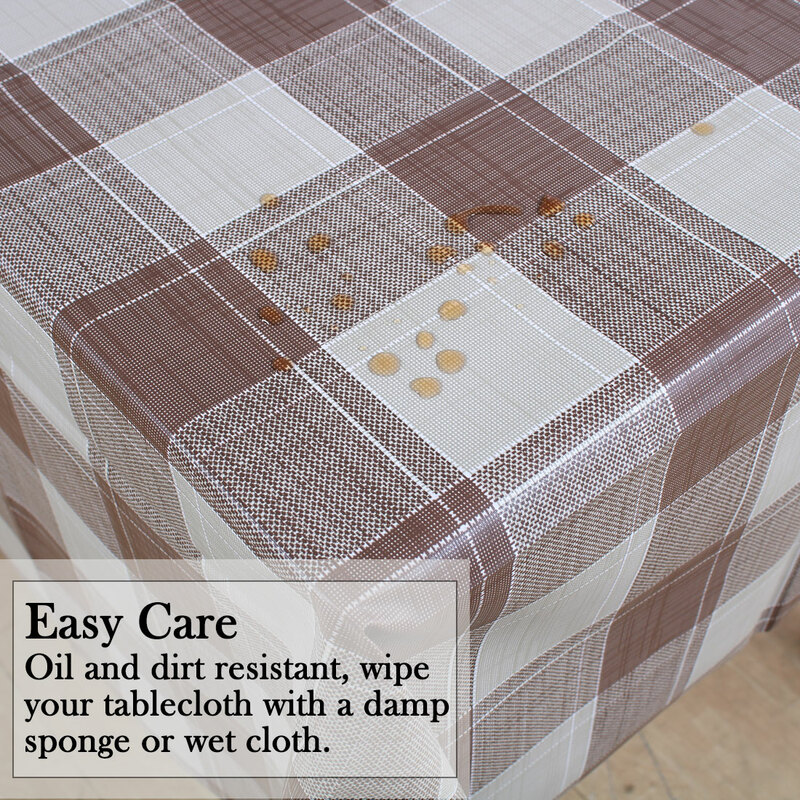 Easy clean: So easy to wipe off any spilled coffee, juice or wine on the reusable tablecloths. Bead up can be quickly wiped clean with a sponge or napkin, keep your table clean, convenient for you to clean up after the meal. 2. Variability of 0-5cm is possible due to the measurement process. 3. If you are not satisfied, we will refund within 30 days, please rest assured to buy. 4. Due to the screen setting difference, the color of the item may be slightly different from the pictures. 5. Since the tablecloth is new, there might be some smell when you use it for the first time, so please make sure you do not mind before ordering. You can put it in the shade to make it go away.